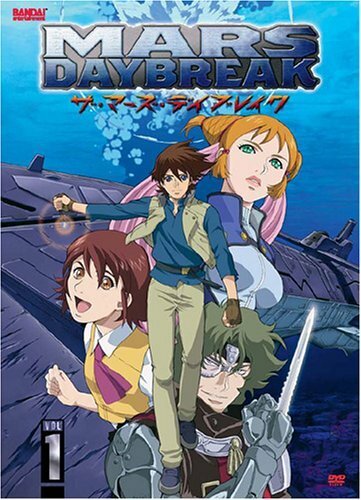 Kenran Butōsai Za Māzu Deibureiku, or Mars Daybreak, is a Humongous Mecha anime aired in 2004 by TV Tokyo and licensed by Bandai Entertainment in the US. The story takes place on a colonized Mars, where nearly the entire planet (save for the peak of Olympus Mons) is covered by a massive ocean (the initial colonization apparently having Gone Horribly Wrong). The people live on floating city-ships, with the planet's abundant water being their primary export. Somehow, the end of the "Pan-Galactic War" has left the planet in the midst of a severe economic depression. Of course, Economic troubles mean crime. And with a planet that's nearly all ocean, that can mean only one thing: Pirates! With the surface under heavy satellite surveillance, the pirates have been forced underground. Or rather, underwater. Instead of sailing over the waves, they lurk under them in submarines. And the baddest pirates around are the crew of the sub Ship of Aurora. Which brings us to our hero, Gram River: A young man living on the city-ship Adena. While trying to help a friend get out of a bad situation, he ends up in the middle of a raid by the Ship of Aurora, and thrown overboard when the port is rammed and breached. Fortunately, a Humongous Mecha comes out of nowhere and rescues him. Unfortunately, this mech is assumed to be part of the pirates' forces, and is promptly attacked by the local Earth Forces mechs. He is eventually hired on by the crew to pilot the mech. Naturally, nothing goes that easy, or there wouldn't be much of a series. The first major complication is the fact that Vess, one of Gram's dearest childhood friends, has just been stationed to Mars as part of the Earth Forces, and she isn't happy at all to discover that he's become a Pirate. The other is the initially-unrelated kidnapping of the Granddaughter of the Earth's President, that they get blamed for when they just happen to go after the real kidnappers for their own reasons, and wind up catching them just as they're trying to ransom her, and further complicated when they end up inadvertently recruiting her. All That Glitters: The Treasure of the Aboriginal Martians. Badass Baritone: Chrysalis Milch and Poipoider. Justified for they are voiced in the English Dub by Jamieson Price and Michael McConnohie respectively. Bash Brothers: Grahms and Yagami. Big Damn Heroes: Several of them but Poipoider somehow makes quite an astonishing amount. He saved Grahms and Enora from falling down. And to the crew when they were under fire in a cave. Vess saved Grahms from the Earth Forces. That's when things became grim Grahms came in with a hammy speech and then came Yagami. Belligerent Sexual Tension: Grahms and Vess, oh so much. Childhood Friend Romance: Victorious Vess. Clingy Jealous Girl: Enora Taft. Combat Tentacles: The main weapon of Kubernes' Mermaid. Conspicuous CG: The Ship of Aurora is rendered through Cel Shaded CG in an otherwise hand-drawn series. Also applies to several of the other underwater ships. Cool Boat: The Ship of Aurora. Dark and Troubled Past: Yagami. FaceHeel Turn: Yagami, Poipoider, Aki and Junior. Subverted. It was just a prank for the birthday of Ester. Freak Out: When Rich found out that Vess is still alive. HeelFace Turn: Anna Grace and Kubernes. Hidden Buxom: Ester, to Enora's surprise commenting how it's not noticeable while she's in uniform. Hopeless Suitor / I Want My Beloved to Be Happy: Enora to Grahm. Hostage MacGuffin: Kenran Butohsai has this, very literally. Enora Taft is the daughter of the President of the Earth who plays a more than willing hostage and friend to the crew of Yoake-no Fune (Ship of Aurora). Jerk with a Heart of Gold: Grahms. MacGuffin: Grahms' pendant and the Box of Guidance. Mecha-Mooks: Earth Force R Bs are remote controlled. A Mech by Any Other Name: Round Bucklers, usually shortened to RB's. Names to Run Away from Really Fast: Subverted with two of the strongest R Bs in the series, named Mermaid and Squirt. Not as much of a surprise given that the other two are named "Vector of Hope" and "Wing of Samurai". Of course Yagami holds this title pretty well, given that his nickname is "Yagami the Shinigami". He backs it up VERY well too given his track record of being able to dismantle multiple enemy round bucklers in a single swoop. He pretty much is pretty much the more experienced version of Graham who is already noted to being capable of taking on multiple round bucklers in his own right. Obfuscating Stupidity: Captain Doolittle to a T.
Only in It for the Money: Pirates! What else? The Only One Allowed to Defeat You: Vess towards Grahms. Our Mermaids Are Different: Kubernos' RB and it is so freakin' ugly. Papa Wolf: Milch towards Megumi. The Pirates Who Don't Do Anything: Kuberness is a partial example. Though he has the loot to back up his pirate-ness, throughout the show he acts more like a mercenary than anything. Red Oni, Blue Oni: Vess' Red to Grahms' Blue and Grahms Red to Yagami's Blue. Red Baron: Yagami is known as "The Grim Reaper"
Rule of Cool: Among the Pirates are a talking Cat and a small whale wearing Powered Armor. No explanation is given for their existence. Sapient Cetaceans: Poipoider, a dolphin who spends much of his time in a suit of power armor wielding heavy weapons. Scooby Stack: Ep 13. NUFF' SAID! Smug Snake: Anna Grace and Niell Poe. Talking Animal: Clara and Poipoider. Talking to Himself: Poipoider and Neill Poe. Both of them were voiced by Michael McConnohie. Too Dumb to Live: Those kidnappers that kidnapped Enora Taft. Took a Level in Badass: Junior, just Junior. Used Future: Very much! We see several ships being dented or what have you buildings. Heck, even a university is abandoned. You Gotta Have Blue Hair: Ester, who has dark purple hair and Megimi, wno has a real deal blue hair. Zeerust: Okay, this was supposedly set somewhere in the future where there are Humongous Mechas are all over the waters yet there are still cars that look like 90's and early of the 2000's and even some like what we have now. Even more that they have the Martian Aborigines that had stuffs that are present in the present.